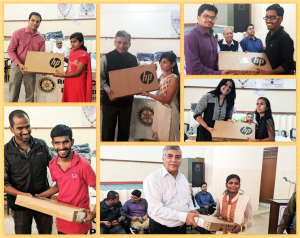 Another step was taken by Xento Systems towards its CSR goal of educating the visually impaired where 20 HP laptops were donated to students at the Technical Training Institute of Pune (TTI). These visually challenged individuals are pursuing their basic and advanced computer courses at the institute. 4th of January marks the birth anniversary of Sir Louis Braille, a French educator and the inventor of the most widely used reading and writing language for the blind, Braille. This day is celebrated worldwide as World Braille Day, to spread awareness about education for the blind. With technological advances today, a lot of assistive technologies have been developed, which now makes reading very simple for the blind. Computers and laptops loaded with such technology is like a superpower for them. With the help of screen reading softwares, it gives them access to a whole new world to explore and learn from. To mark this auspicious day, Xento donated laptops to empower these children and bridge the gap which hinders their integration in society. With the latest gizmos, they are equally able to communicate in a language that is known to everyone. It greatly reduces their dependency on having a writer or someone to read out to them. The success of this project is dedicated to the employees of Xento and Entrata, who successfully organized fundraisers and collected funds for this cause. They organized a CSR Mela and a raffle draw fundraiser, respectively, and everyone participated and contributed generously towards this cause. Xento’s CSR also put in an equivalent amount as was donated by their employees. These 20 visually challenged students come from financially poor households and would never be exposed to such opportunities, if not for organizations like TTI, who are working for their welfare. The laptop will now help them to even utilize their spare time in the best way. They can now prepare for competitive examinations, read e-newspapers and browse the internet to improve their vocabulary and knowledge. This will also contribute towards increasing their prospects of employment, as they will be well versed with a computer and can work in many jobs as an equal contributor.